Condorcet polling provides additional information about pairwise rankings often obscured in standard polls when there are three or more candidates. 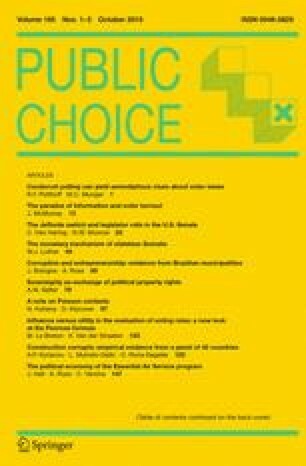 This paper analyzes an original dataset collected from Duke University students in North Carolina concerning the 2014 Senate race, wherein a Democrat, a Republican, and a Libertarian contested the election. The results illustrate that Condorcet polling is feasible in such a context, and that the information provided changes the strategic calculus of voters in ways that may have a positive impact on the way votes are cast and choices considered. The authors thank Austin Wang for his technical help in setting up the survey. We also acknowledge the assistance of an anonymous reviewer, and the Editor, in improving the manuscript. Errors that remain are the sole responsibility of the authors, however. This paper used human subjects as respondents to a survey. The survey was conducted according to the standards and requirements of the Duke University Institutional Review Board. As part of the survey introduction the process was explained to the subjects, who had volunteered to be part of the Political Science “Subject Pool.” IRB approval was sought, and granted, for the procedures to obtain informed consent. The survey forms are included verbatim as attachments to the paper. The questionnaire had two forms, I and II. A respondent received one of the two forms, with one of six candidate permutations used for Questions 1–3 of either form. The 12 combinations of the two forms and six permutations were assigned with equal probability to the respondents. In all cases Questions 1–3 had the structure A versus B for Question 1, B versus C for Question 2, and C versus A for Question 3. For each permutation, the following table shows what was substituted for [A], [B], and [C] in the two questionnaire forms that follow the table. The three hypothetical questions below deal with the three U.S. Senate candidates in the November 4, 2014 election in North Carolina. Please answer by assuming that you are a North Carolina voter in case you are not one. Please read and consider carefully before you answer. If [A] and [B] were the only two candidates on the ballot, which one would you vote for? Neither; I would not vote at all in this match, even though I feel that I know enough about both choices. I do not know enough (about one or both choices) to express a preference. If you have any comments about any aspects of this survey, please enter them below. The three questions below deal with the three U.S. Senate candidates in the November 4, 2014 election in North Carolina. Please indicate your preference within each pair even if you are not a North Carolina voter. Please read and consider carefully before you answer. If [A] and [B] were the only two candidates you could choose from, which one would you prefer? Neither; even though I feel that I know enough about both choices, these two are equally bad or equally good. Cassidy, A. (2012). Johnson campaign files last ditch lawsuit against CPD. Uncovered Politics. Retrieved February 21, 2015 from http://www.uncoveredpolitics.com/2012/10/19/johnson-campaign-files-last-ditch-lawsuit-against-cpd/; http://www.scribd.com/doc/110496549/Complaint-Against-Commission-on-Presidential-Debates.